Monuments and Forts of the Deccan Sultanate is part of the Tentative list of India in order to qualify for inclusion in the World Heritage List. 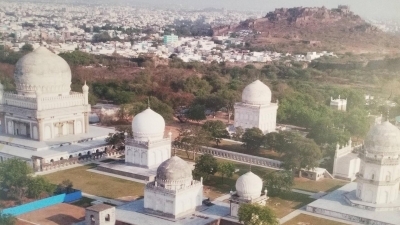 Of the 4 nominations I visited the "easy one", the Qutb Shahi tombs in Hyderabad, and with Hyderabad being on the tentative list at the same time there are more things to see than the mosques all over town, but the Golconda fort being nearby makes this an easy morning tour of the western part of the city. The other 3 nominations are in smaller towns but not unreachable, but unfortunately I found nothing else to combine it with over there so one location will do. Perhaps on a future trip when it is inscribed. You actually don't need to get a ticket to see at least one of the tombs, although the guard points you to the ticket counter at the front gate. The first tomb of Abdullah Qutb Shah is just before the ticket check. Naturally you want to see more than that because all tombs are nice, and for a low cost of 50, yes, 50(!) Rupees this is a ridiculously low fee. Sure, you pay another 50 for the mobile camera which today is hard not to have and the nice man didn't even charge me but I said I would take pictures so he took the 50 back. Most WHS sites are 600 now, and even non-WHS sites charge maybe 200-300 for foreigners. I am sure this will not stay low for long. Still before the ticket check is a museum dedicated to a little history about the Deccan dynasty, restoration project as well as future ambitions. It is in English, Hindi and Arabic. There is a panel declaring it always keeps integrity according to the “UNESCO standard”, and in fact a lot of renovation is ongoing that indicates a push for inscription in the next few years. More on that soon. Once inside the main area you will quickly see more tombs and mosques. Whereas they all seem very alike you can spot the differences and each one is worth investigating. One can also visit a few interiors. The area is not big and an hour is enough to have circled back to the entrance, yet if the total area would be available to explore this would easily double. There are some fenced off and very neglected areas in the northern section, a newly… built… or strongly renovated southern section, and the center has what appears to be a once beautiful garden with fountain that was very neglected. Given some more time this could well be a more interesting visit than the Red Fort. Throw in an audio guide rather than the pushy people (one asked me for a tip if he takes photos of me which I had already rejected, another told me the name of a tomb and wanted 50 rupees for just that even though it says on both Google map, the billboard nearby and the panel 3m away AND it turna out he was just a cab driver who wandered in!) and clean up the place it would be wonderful. I only saw one foreign couple and not even that many Indian tourists which is really surprising, there are masses going to see the lousy fort instead. Museum could do with a bit of an upgrade too, but there are more displays in the cool basement of the massive tomb of Mohammed Quli Qutub Shah, apparently the main attraction of the selfie crowd. Pro tip: good picture is taken from in front of the MQQS tomb with three more in sight on the right - just across the closed off garden, you will know. Another down west with a long row of pillars. 2nd pro tip: you can have a cab drop you off inside the gate aa long as you get out and buy a ticket to continue the ride, else walk in 4 minutes. Parking only applies for personal cars. Last pro tip: an auto ride between here and the fort takes 10min and costs less than 100 rupees (2018 prices). Interesting fact: foreign prices are the same as locals, a first for me! Ironic as I would probably pay more to see this than the 200 I paid at some of the places around town, which are much higher for foreigners! !